Invite young partygoers to Chicken Little party to celebrate your special occasion. This page will help you with planning invitations, decorations, games, food, and so on. To make your Chicken Little birthday invitations, trace a picture of Chicken Little on folded piece of construction paper. (Keep it next to the edge of the fold, so the card stays intact.) Cut the shapes out and write your Chicken Little party details inside. The invitations can say “Attention! The sky is falling! Help Chicken Little and friends save the day at (your child’s name) __th Birthday Party!” Then include address, date, time, and ask the parents to RSVP. As a variation, print a picture of Chicken Little (and other characters from the movie) on the front of white invitation cards. Write party information on the inside of the cards. Decorate the invitations with theme stickers. Finally, you can attach Chicken Little party invitations to theme items (e.g., glasses, cups, bubble bottles, etc.) to send along with. Kids will be excited about receiving gifts via mail. Have blue, yellow and red colors for your Chicken Little party decorations. Purchase balloons and streamers in those colors, and spread them out throughout the yard and inside the house. Play Chicken Little theme music in the background. Write a sign that says “Watch out! The Sky is Falling!”, and put it on the fence. Decorate the fence with images of characters from the show (Runt of the Litter, Ugly Duckling, Fish out of Water, Chicken Little, and others). Cut out some chicken “foot prints” out of yellow construction paper, and tape them to the fence as well. Create a balloon arch by tying colorful balloons to a kite string (about 12″ apart). Place the arch near the entrance to your driveway. Spread out plastic “chicken” eggs (available from party stores) all around the yard. Tape theme-related signs or posters to trees. Create the sky inside the house by taping blue construction paper and white cutout clouds to the ceiling. Draw and tape an alien spaceship on top. Attach several paper streamers to the ceiling in the center of the room, and stretch them to the corners of the room to add to the “sky is falling” effect. Hang balloons in bunches by tying a colorful ribbon around the strings of several balloons, so they hang together. Attach Chicken Little posters to the walls. Spread out some baseball accessories (e.g., bats, helmets, etc. ), as well as theme toys or figurines around the area. Create multi-colored streamers by placing two different colored streamers back-to-back and twisting. Cover your Chicken Little party table with a theme cloth. Print and download images of Chicken Little. Then laminate and put them at each setting for placemats. Position Mylar balloon in the middle of the table for a centerpiece. Tie latex balloons to the backs of the chairs. Hang a personalized “Happy Birthday” banner nearby. *“Decorate the Chicken” Craft: Before the party, cut chicken shapes out of construction paper. At party time, give one to each Chicken Little party guest along with decorative items (yellow feathers, googly eyes, sequins, etc). Get the children to decorate their own chickens. *Coloring Pages: Have activity books and coloring pages available for kids, so they can stay occupied while waiting for others to arrive. For Chicken Little party favors, hand out such items as blowouts, kaleidoscopes, Chicken Little bubble blowers, glasses, sticker sheets, candies, activity books and disk launchers. *Egg-Cellent Hunt: Before the Chicken Little party, fill plastic eggs (that open) with theme stickers and other small prizes. Then hide the eggs all over the play area. *The Sky is Falling: Inflate blue latex balloons before the party. At game time, throw several balloons into the air and have your guests keep them up in the air by tapping them with their hands and arms. 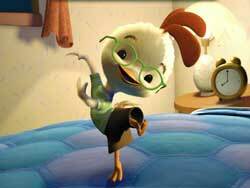 *Chicken Little Dance: Play funky dance music and invite the kids to form a circle. Then have children take turns playing Chicken Little: he or she must step into the circle and start making dance moves while everyone else imitates. Let dancers switch when they want, or pick a new Chicken Little every minute or so. *The Aliens are Coming: Pick one or more players to be the Aliens and the rest of the players will be the town folk from Oakey Oaks. When Aliens hear the command “Blast ’em”, they must try to catch as many town folk as they can. If players get caught, they must go to a designated area called “spaceship,” where they must stand still with their legs spread apart. To be rescued, one of the “free” town people has to crawl through the captured player’s legs. Keep playing until everyone has been caught, or it’s time to move to the next game. *Ducky Lucky Pond: During this Chicken Little party activity, kids get a chance to win prizes. You’ll need a waterproof marker, rubber or plastic ducks (one per each guest), prizes (or favors) in separate bags (one per guest), tub or kiddie pool filled with water, and colander with handle. Draw a different number with a marker on the bottom of each duck. Next, write matching numbers on each prize bag. Place rubber ducks in the water. Let each child take a turn using the colander to scoop out a duck. Match the duck’s number to bag’s number for child’s prize. *Sky Rock: For this Chicken Little party game, you’ll need a small or medium-size rock (“piece of the sky”). At game time, sit the guests in a circle and play theme music. Ask the kids to pass sky rock while the music plays. When the music stops (stop it randomly), the person holding the rock goes out of the game and receives a small treat. Continue playing until there is only person left in the circle. *Crazy Little Chicken: The goal of this game is to make others laugh, but restrain oneself from laughing. Have the kids sitting in a circle. Birthday child starts the game by saying “I’m a crazy little chicken” in a funny way that makes other players laugh (but without laughing himself). Next, the person to his right must say the same phrase twice. The game continues in this fashion, with players adding a string of words every time (e.g., third player must say the phrase three times, fourth player four times, and so on). If somebody laughs, he or she must go out of the game. (Children that are “out” must make others laugh by making silly faces and actions, but without talking or touching others.) Last person left in the game, wins. *Friendly Baseball: Invite your Chicken Little party guests to play a game of baseball outside. If you have really young group of kids, play a modified baseball version (or other sports game). *Sky Bean Bag Toss: Get the kids to toss blue bean bags (or blue socks filled with dried beans) into the buckets from a distance. You can also download a picture of Oakey Oaks town and put it on the side of a cardboard box. Cut out the top flaps from the box, and have children toss their bean bags inside the box for points. *Quiet Time: At the end of the party, invite everyone to watch Chicken Little DVD or listen to a story. This is a great opportunity for the kids to unwind after a day full of fun! *Chicken Little Cake: Bake a rectangular or round cake according to cake mix package directions. Get a picture of Chicken Little and cover it with a piece of waxed paper. Next, trace the outline with a toothpick and frost sections of the cake accordingly. *Falling Sky Quesadillas: You’ll need whole wheat tortillas, grilled or stir-fried onions and peppers, grated cheese. First, take a tortilla and use kitchen scissors to cut out 6-sided hexagon shapes. (You may want to create a cardboard shape to use as an outline.) Layer vegetables and cheese on a second tortilla and add the tortilla with hexagon shapes to the top. Bake on a cookie sheet in preheated oven at 300°F for about 5-10 minutes, until the cheese melts. *Morkupine Porcupine Quills: For this Chicken Little party recipe, you’ll need grapes, ripe melon balls, berries, banana chunks, half of a melon and Popsicle® sticks. *Chicken Little Eggs: You’ll need whole, uncracked eggs and crayons (in green, orange, black and red colors). Cook eggs. Then draw on Chicken Little’s green glasses, black eyes, brows, orange beak and red comb. Refrigerate until serving time, or let the kids decorate the eggs at the party. *Runt-of-the-Litter Ice Cream: For this Chicken Little party recipe, you’ll need cherry or pink bubblegum ice cream, chocolate chips, pink jelly beans (or other small colored candies), blue gumdrops and black decorator gel. Scoop a large ice cream ball onto a cupcake wrapper for each guest, and place it on a cookie sheet. Add 2 chocolate chips for the eyes. Use a melon baller to add a second ice cream ball for the nose, adding 2 more chocolate chips for the nostrils. Next, push in jelly beans for ears and create eyebrows using decorator gel. Add a gumdrop for the hat. Twist pink pipe cleaners into spiral pig tails and insert one into the side of each pig. Store in freezer until serving time. *Falling Sky Cookies: You’ll need sugar cookie dough, blue and white frostings, butter knife and a cookie sheet. Roll out cookie dough and cut into 6-sided hexagon shapes. Bake, cool, and frost cookies blue. Use white frosting to create puffy clouds, so the cookies look like pieces of the sky. *Abby Mallard’s Piña Coladas: For this Chicken Little birthday party drink recipe, you’ll need 46 oz of pineapple juice, 15-oz cream of coconut (canned) and ice. Combine all the ingredients in a blender and whirl until smooth. (Split to avoid overflow.) Serve with cocktail umbrellas for an extra fun touch!